Home > Fashion > True Color Technology? AVON has it! Hello beauties, are you looking for more vivid colors? Avon has it all now! They have covered lipsticks and eye shadows with the new True Color Technology. The new technology keeps the color in the same tone as when applied. Avon has come up with True Color Lipsticks in affordable range. They have tried to improve and modify the old version of Ultra Color Lipsticks. They have infused Shea Butter in the lipsticks which gives a smooth, soft and creamy texture to our lips. We are really impressed with the quality and formula of these lipsticks. Moreover, they do not settle down in the fine lines of the lips. These lipsticks come in a wide range from brightest shades to vibrant shades for your daytime outing and night clubbing. We tried, the Sunny Pink shade for summer natural look and it was a hit! Also, the colour that appears in the lipstick bullet is exactly what appears on the lips! P.S. One can even mix and match the shades to get perfect pout lips. Packaging: The lipstick case is of shiny black plastic with a silver ring in the bottom where “AVON” (company’s name) is engraved.The case looks elegant and the shine gives a luxurious feel. 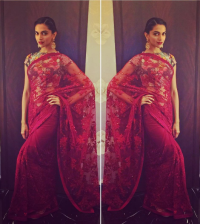 After looking at Deepika Padukone’s bold green smoky eyes, who would not love to try that on oneself. 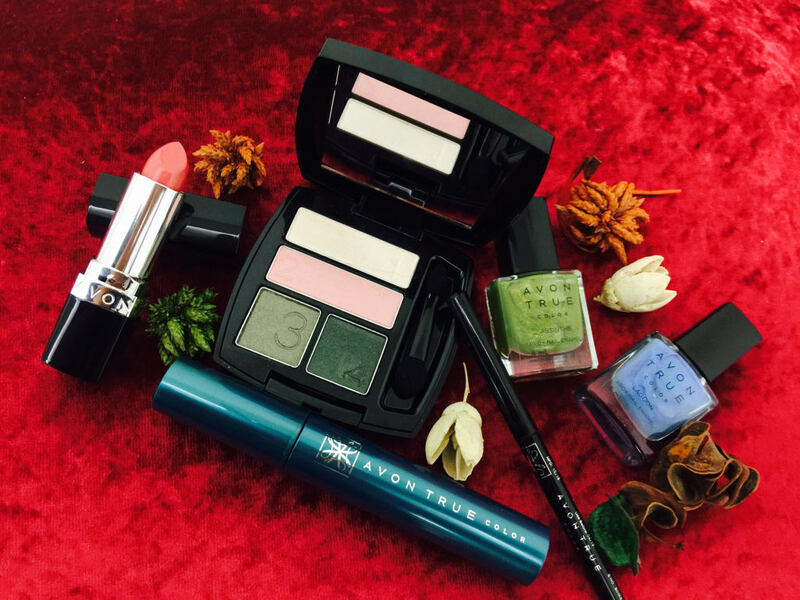 So, here Avon is out with all-in-one kit easy to use eyeshadow quad. It has a all the shades for prefect smoky eye; from highlighter to the dark bottle green shadow. Also, for the beginners, it has the numbered shades for our easiest expert eye looks with a convenient mirrored compact. 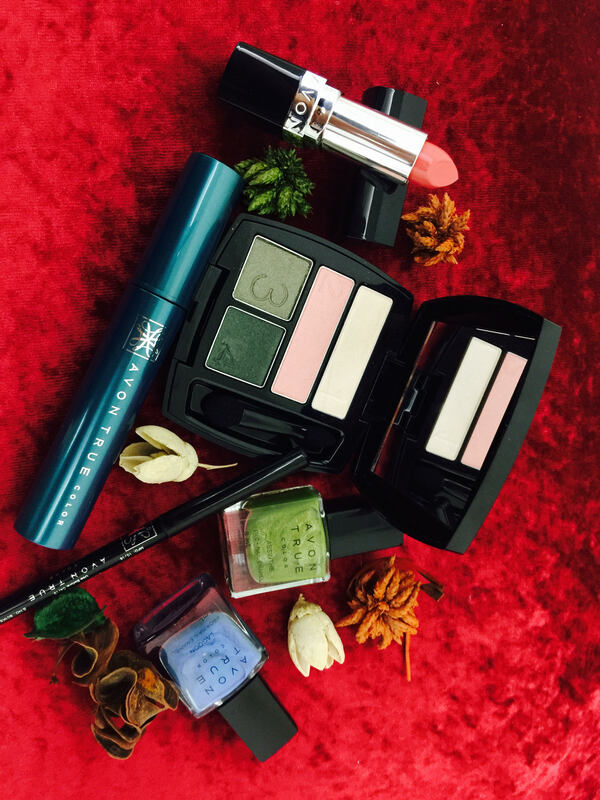 This fuss free and fail free make up performs the way you expect. 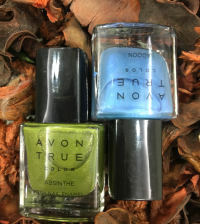 AVON True Color Eye Shadow Quads are 5.6 grams per quad available in 5 different variants. Packaging: This eye shadow comes in a very beautiful packaging which has the brand name “AVON” written at the front. When you open the shadow, you find a beautiful and quite handy mirror along with these 4 beautiful colours. Packaging: The mascara comes in a cylindrical light weight plastic tube and the tube feels like it has nothing in it! It comes in a marvelous shade of teal. It is glossy and shiny and looks so posh. Plum isn’t not only about lip colors, but it is now for eyes too. The new Glimmersticks Kajal in Deep Plum Color is a new in trend. Apart from Deep Plum, these are available in 4 other shades like Red Brick, True Red and Chocolate. It comes in a retractable tube which is good and can spare me from sharpening. Also, best of all, it is smudge free! Practically. no cons of this product. Packaging: The kajal comes in a twist-up format that retracts into place, unlike those in other brands. The packaging includes a black turquoise-blue strip and is easy to carry around. The ingredients are not mentioned. Best part about these products are that they all are Dermatologist, Allergy and Clinically tested.